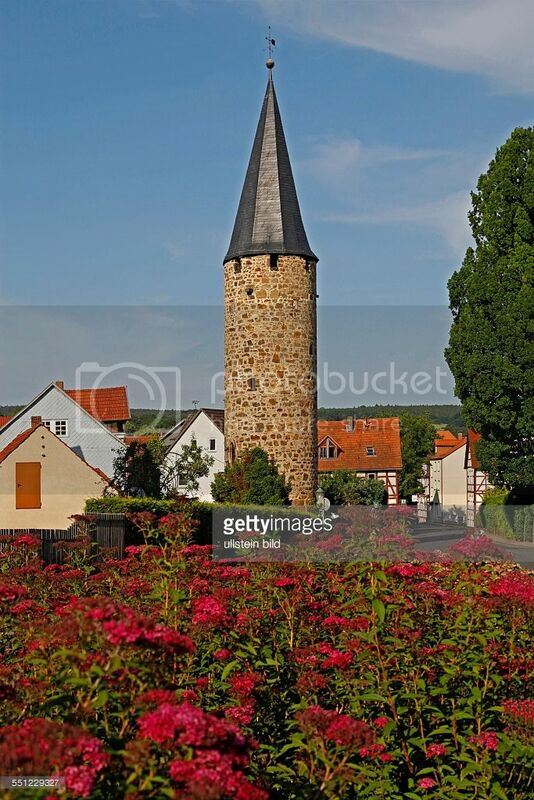 Maybe it is the Owl Tower (der Turm der Eule) in Spangenberg. Go on Yves, get fhe correct city quickly! So, another try:Melsungen,still in Hessen land. Maybe you found it before me Ivy? i drove through that city when i had to load logs a few miles east of Melsungen, a village called Kirchhoff. wich is a funny name for Dutchies,translated to dutch Kirchhof is Kerkhof,a kerkhof translated to Englisch is graveyard,while in German language is Friedhof. so only in Dutch its a funny name. the same kind of translated city names is from WW2,at operation market garden,they have to take the bridge at a city called Grave,but what is in Englisch ,grave.to not make it difficult to the soldiers (we were shot at grave),they renamed that place. (can't remember wich name they gave it) but didn't make any sense,that name wasn't much better. No way, Yves, I hadn't a clue and had more or less given up. Then you came up with an Owl Tower, although in the wrong town so I Googled for any others and there it was. How you found the first one I don't know. Very well done, anyway. Where can you see this statue? The first question will be: is it in France? 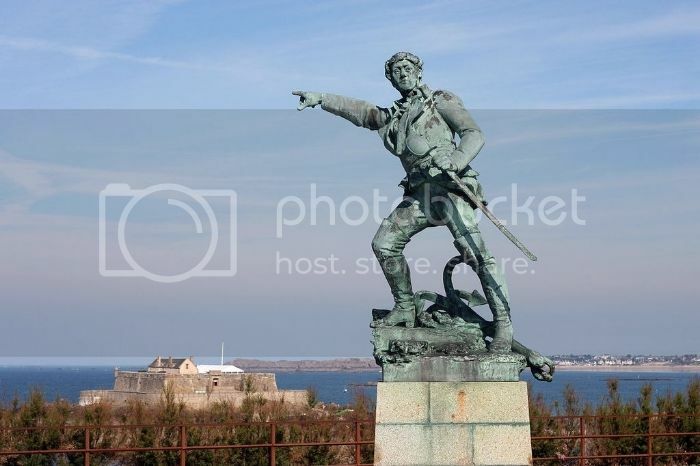 Why do I get the feeling that he's saying "England's this way boys, let's go and visit."? Well,I'd say this man had few meetings with Brits,not only to enjoy a cup of tea! Well I reckon that the chap in the nice wellington boots, doing his best John Travolta 'Saturday Night Fever' pose, is in fact Robert Surcouf, and that he's in St Malo. 'Privateer and slave trader'? Never seemed happier than when he was sinking British ships. Perhaps the sculptor took courses in the bay of Disko! Never seemed happier than when he was sinking British ships. It's your turn now Mark. OK - loads of clues in this one. At the first look,it seems to be somewhere in Scandinavia.Bohuslan? Phew...Number of harbours like this one in the archipelago. Yes, loads of them - all beautiful! Not Fjällbacka. Ingrid Bergman lived there didn't she? Yes I think so.And several Swedish authors,it seems. I'm going to guess Grebbestad. At least I hope "an educated guess", but entirely based on the green, presume bronze, statue visible behind and to the left of the man at the harbour corner on the right of the photo. 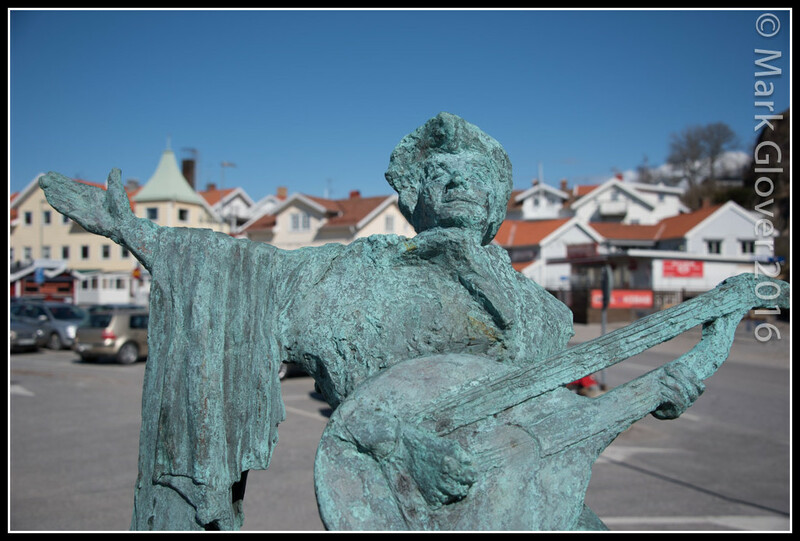 It is surely the troubourdor Evert Taube - similar, or a copy, of the sculpture by Willy Gordon in Stockholm on the quay at Riddardsholmen. I know that Taube had some association with Grebbestad (although he was born in Göteborg and lived on Vinga where his father was a lighthouse keeper). Spot on Cecilia - as ever! Yes, the Evert Taube sculpture is on the bottom right. My car is in that photo too, but not many people come to visit that and have their photos taken next to it! 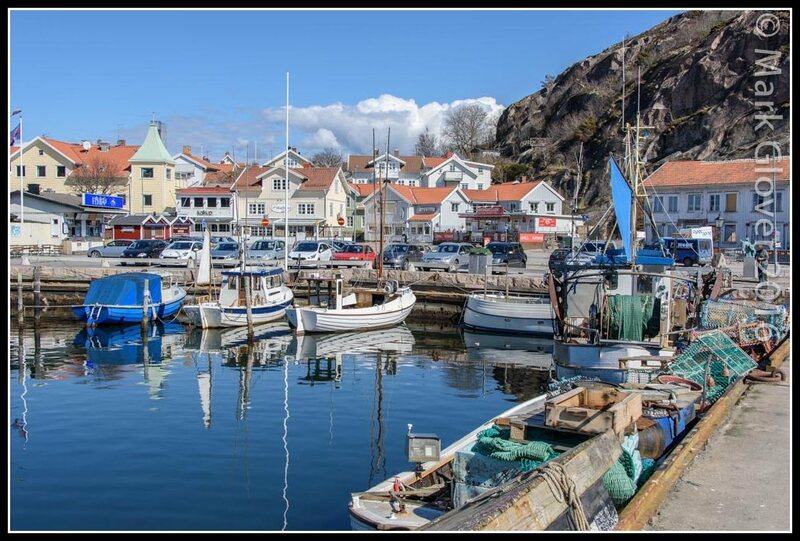 I love that little bit of the world, one village after another, down by the water, pretty houses, good cafes - wonderful. Anyway - back to a Seagull puzzle. whats the story of his 3 hands?